Multiple global crisis’s have brought the discipline of risk management into focus. Companies both in India and in overseas are under considerable pressure to protect customer information and privacy, and sensitive business information (business plans, intellectual property, etc.) against threats from cyber criminals, competitors, and even hostile governments. Forward-thinking companies have implemented risk management and compliance initiatives. They have avoided check-box compliance and re drill responses to security incidents in favour of sustained, continuous, and auditable risk management programs. In uenced by growing regulatory and governance requirements, many companies across the world have formed Board level risk committee to take a formal enterprise wide role in risk assessment, mitigation and the oversight. Corporate leaders today see value in linking risk to strategy and using risk information to make risk informed strategic decisions. 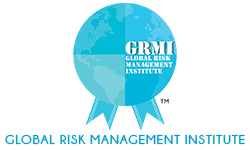 members who bring just the right blend of international academic excellence and domain expertise in risk management. We believe deep domain knowledge, combined with experiential learning imparted by an exceptional faculty team, along with our on-the-job internship Programme, will make GRMI graduates extremely relevant and valued in their profession, whether in reputed consulting rms or in large corporates. Our aim is to cultivate and promote a generation of risk-intelligent professionals who are ready to navigate in a complex corporate environment, equipped with the knowledge of global markets and understanding of how risk and technology permeate every type of business. On graduating from our institute, our students, will learn to spot emerging market trends and capitalize on them for competitive advantage. In this VUCA (volatile, uncertain, complex and ambiguous) world, the new generation Managers and Entrepreneurs will be challenged to develop, deploy and maintain implement a practical and holistic risk management approach which will help them address evolving risks and succeed in the new business environment. We are con dent that our programme at GRMI will help entrepreneurs, students and business leaders in addressing these risk challenges while helping to grow their business. He has received 6 international finance awards in PepsiCo, which includes recognition for Strategic Impact, and People Leadership and Control Excellence. He has created a non-routine & enterprise risk assessment toolkit to identify and address non-routine risks, and also best practice tools for Agro accounting and Fraud risks.